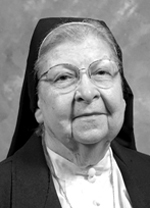 Sister Maria Barbara Danko, I.H.M. Sister Maria Barbara Danko, I.H.M., formerly Mary A. Danko, died Oct. 11 in Camilla Hall, Immaculata, in the 79th year of her religious life. She was 96 years old. Born in Connecticut, Sister Maria Barbara entered the Congregation of the Sisters, Servants of the Immaculate Heart of Mary in 1935 from St. Cyril Parish in Reading, Pa., and professed her vows in 1937. For a short time she taught grade school in Philadelphia and Ashland, Pa. She taught English in high schools in Philadelphia, Levittown, Pottsville and Tamaqua, Pa., and Miami, Fla. Sister Maria Barbara resided in Immaculate Heart Convent in Norristown before going to Camilla Hall in 2006. The funeral Mass was celebrated at Camilla Hall Oct. 15. Father William E. Dean was the celebrant and homilist. Sister Maria Barbara is survived by members of her religious community, a nephew, grandniece and grandnephew.